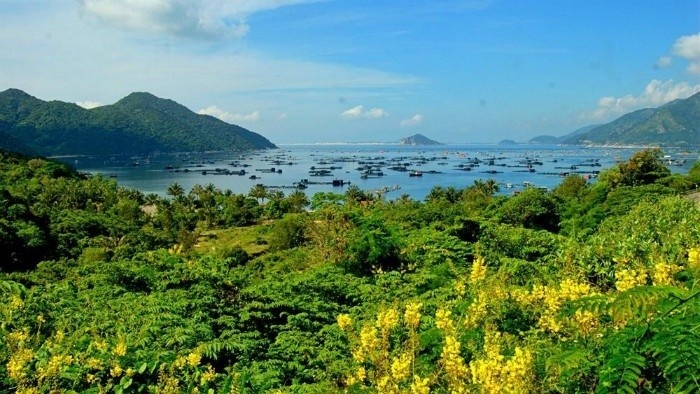 After the success of Victor Vu’s drama (a top Vietnamese filmmaker) “Yellow flowers on the Green Grass”, which was sales at Cannes, Phu Yen was widely known and has become one of the most sought-after destinations because of its fairy beauty. 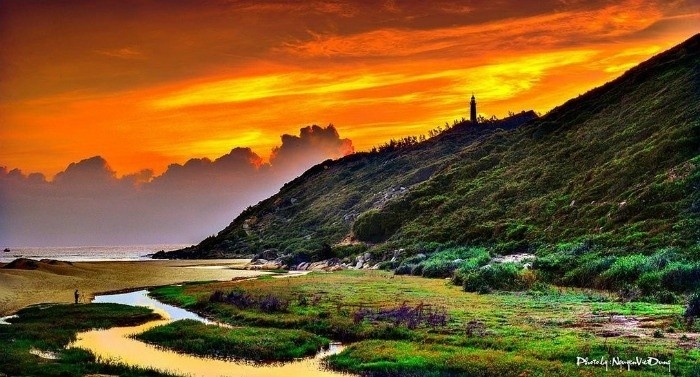 Indeed, the extraordinary charm like a painting of Phu Yen from every footage on the screen reveals exactly the true Phu Yen in real life. 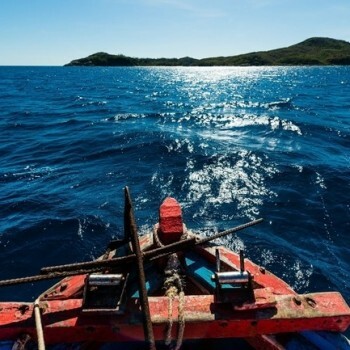 Let’s escape from the bustle and hustle of urban life and travel to the beautiful Phu Yen, where there are vast green rice fields, the amazing Da Dia Reef-a natural wonder, Xuan Dai Bay with glassy water or golden sand on Dai Lanh Cape. 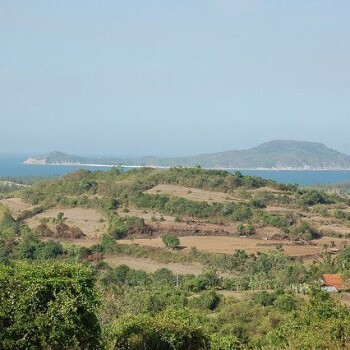 Phu Yen is a coastal province in the South Central Coast of Vietnam. The land is like being filled with sunlight and wind all the time, fine sands stretch along the turquoise sea which has a strong appeal for tourists. 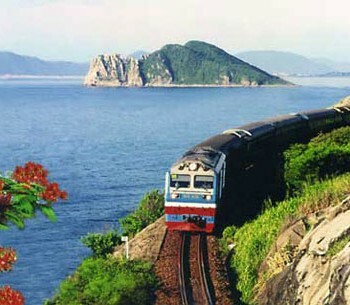 Besides, Phu Yen impresses tourists by its endless green field, mighty mountains, and the scenic spot Da Dia Reef created by the Nature. For all those reasons, the land is renowned as a fairy land and an ideal destination for escaping from the busy urban life. 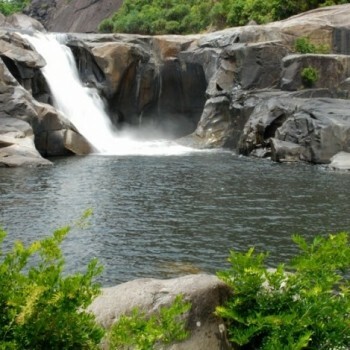 Come here and revel in the peace of life, take a deep breathe in a space filled with only fresh air, listen to the pure melody of the nature, immerse yourself in the cool water or wander around to perceive the fairy beauty of this land and so on. 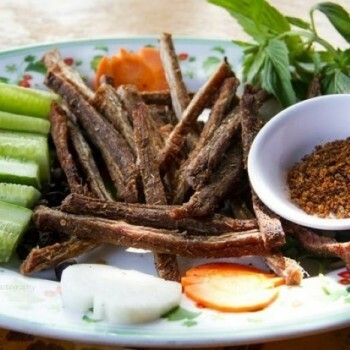 All of those things will gift you a fantastic experience in Phu Yen. 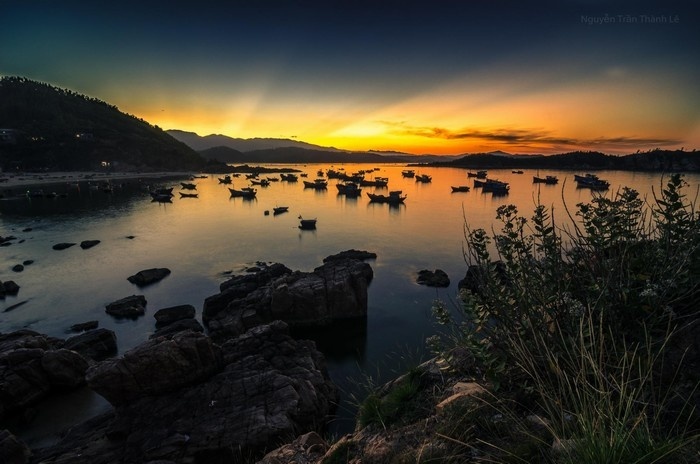 Referring to the enchanting Phu Yen, Xuan Dai Bay is an indispensable natural splendor that must be talked about. 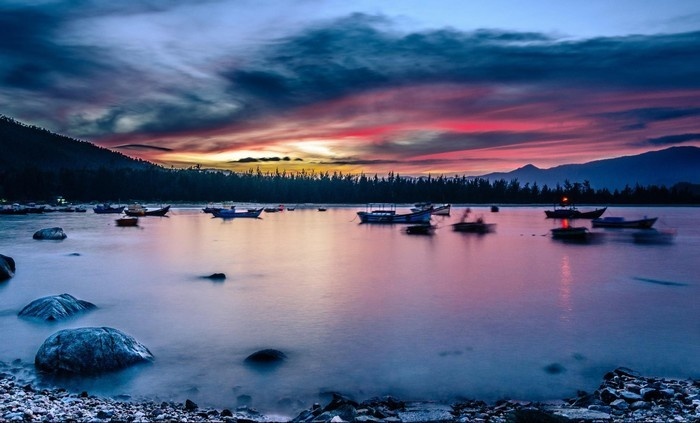 It’s hard not to fall in love with Xuan Dai Bay at first sight for numerous tourists. 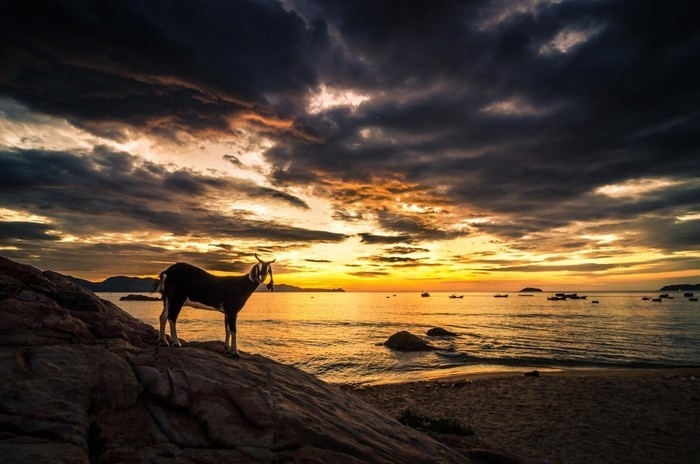 Xuan Dai Bay just likes a sophisticated and harmonious painting with Co Ngua Mountain, crystal clear seawaters sparkled in the sun, rustic fishing villages, coconut trees casting a shadow on pristine white sands and so on. The magnificent and poetic allurement of the Bay has been making it up the hottest destination for many wanderlusts. Xuan Dai Bay has three sides surrounded by vigorous mountains with rocks in a variety of smooth shapes embrace each other. Breaking waves push water all the time towards the land, which creates white rip currents. When the sun has just woken up and the landscape is still covered with faintly mist, this is the most picturesque moment of Xuan Dai Bay. You can just simple sit on the sand and enjoy fully all of those brilliant moments. 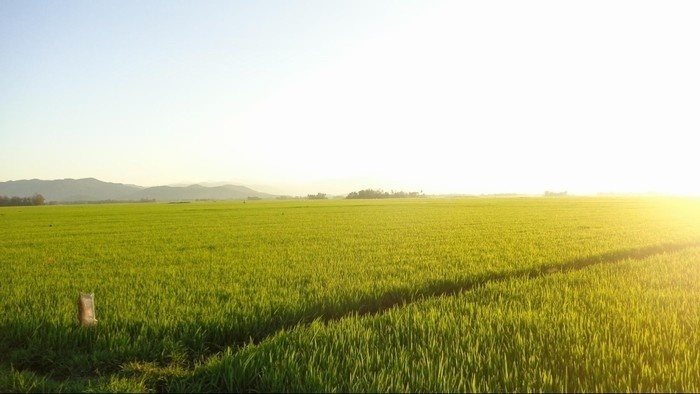 Another destination should be visited is Dong Hoa, where there are smoothly green field spotted with white wings of gilding storks. 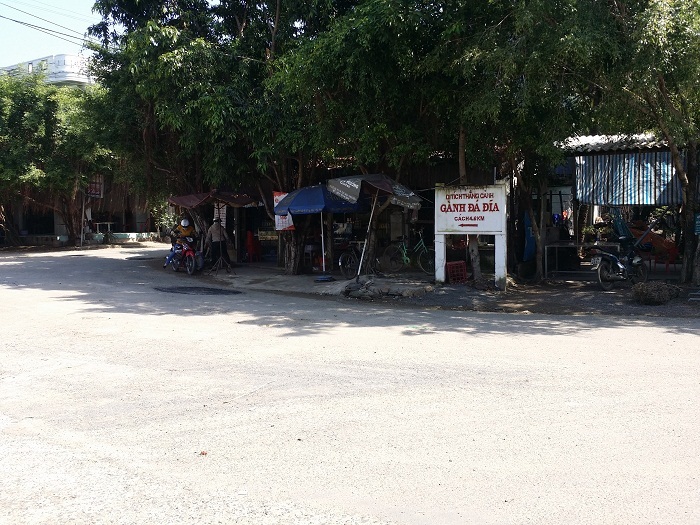 Dong Hoa is a rural district in the south of Phu Yen Province. This place is always filled with peace and freshness. On the vast green ground, you can easily catch a sight of kids flying kites and listen to the soft and graceful sound of the flute. 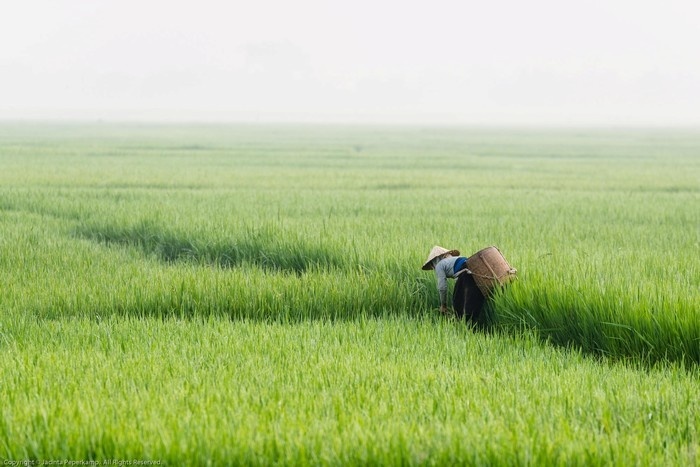 Besides, rice fields in Tuy An, which appeared in the drama “Yellow flowers on the green grass”, are also attractive to many Vietnamese. 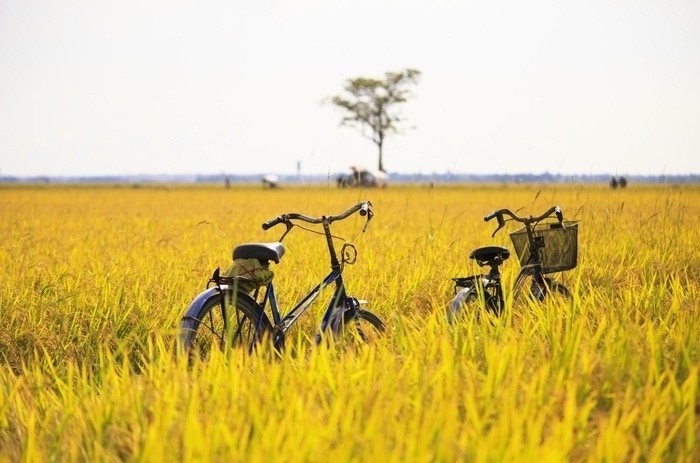 During the harvest, laden rice plants dye a brilliant yellow like gold throughout the whole field. The view in your eyes at that moment would look like a harmonious oil painting with yellow is the dominant color. The Da Dia Reef, a unique wonder from the Mother Nature, has astonished and become the best-known destinations for both domestic and international travelers. 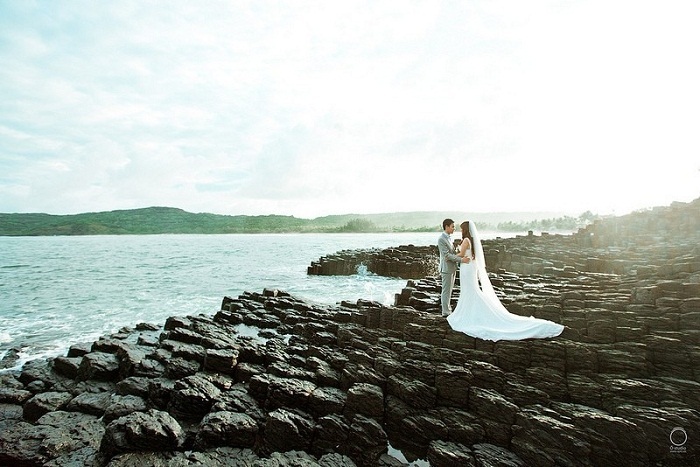 The Reef includes gigantic blocs of rocks with various shapes. 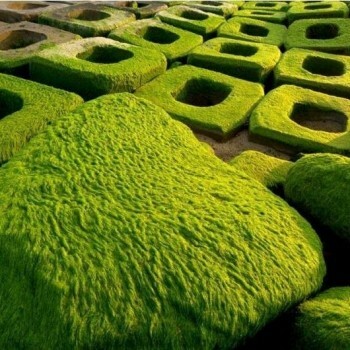 However, for the locals here, those shapes all look like plates and they are closely connected into one solid unit uniquely and breathtakingly. The Reef was named after this reason. Da Dia literally means “plate rocks”. 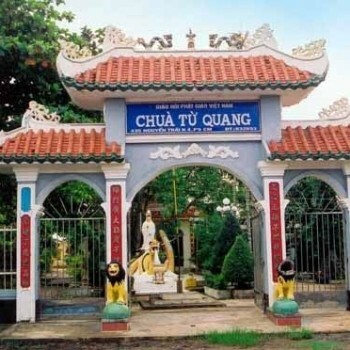 Many Vietnamese couples has come here to take many enduring moments for their wedding. Once you set foot on this fairy land, everything is transformative. 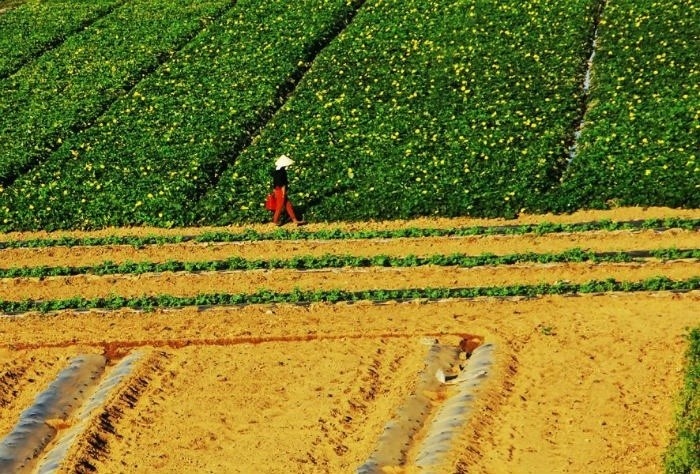 Your heart will skip a beat when you first feel the tranquil, colorful, poetic and full of love of the “Nau” land. 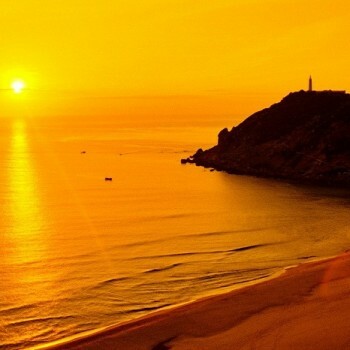 In particular, you should not miss a chance to welcome the dawn on Mui Dien Cape-a place to receive the first sunlight of the day in Vietnam as well as a unique place to see the most picturesque sunrise in Vietnam. 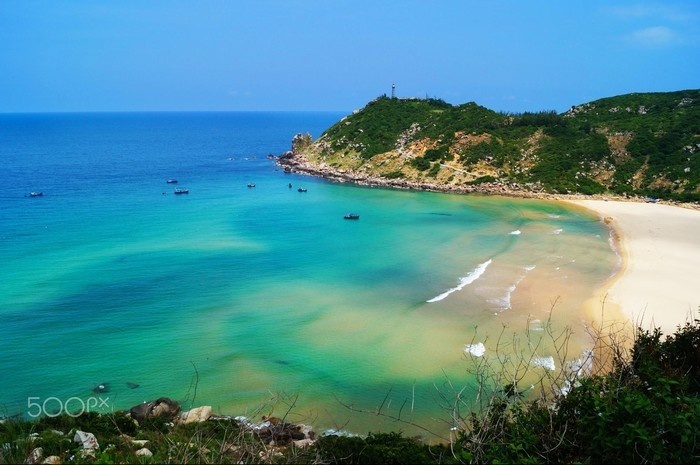 Mui Dien Cape is the easternmost point of Vietnam and also known as an alternative name as Dai Lanh Cape. 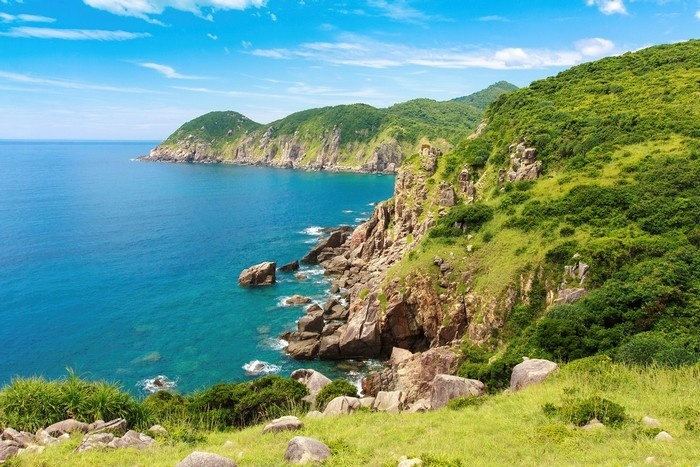 Climbing up a tall lighthouse, an important highlight of Vietnam’s territory, and stretching the eye farther to explore the clear blue water is first thing of all that one should do when visiting Mui Dien Cape. 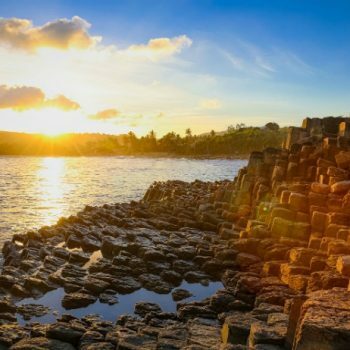 The scorching sunlight and strong wind of the coastal land cannot even bother you to indulging yourself in the dawn and enjoy the serene and fairy view of the landscape.